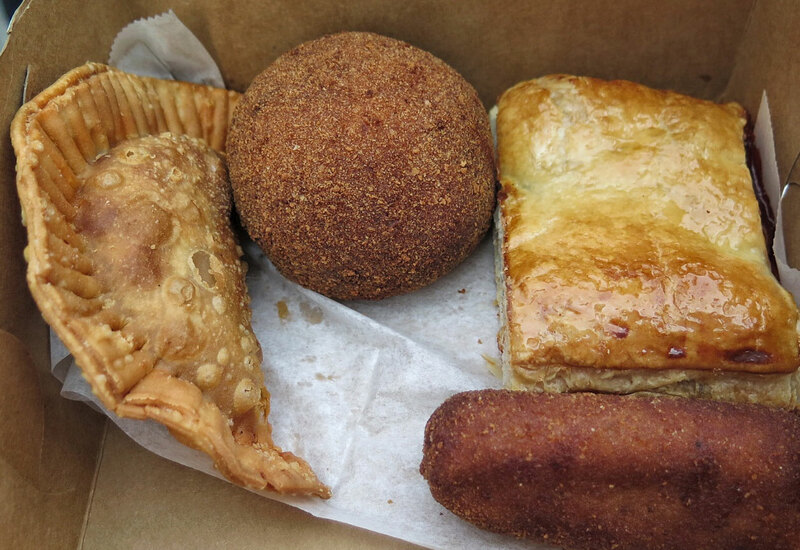 Mobile bakery Buena Gente makes an unrivaled Cuban and much more. Catch them when you can. The Cuban sandwich right off of the press at Buena Gente. Atlanta arguably lost all of its good Cuban sandwiches way back in 2008 when Havana Restaurant burned down and Kool Korners closed. No matter where I looked, I couldn’t find one that was up to par. The bread wasn’t toasted enough. The cheese wasn’t melted enough. The roast pork had no flavor. 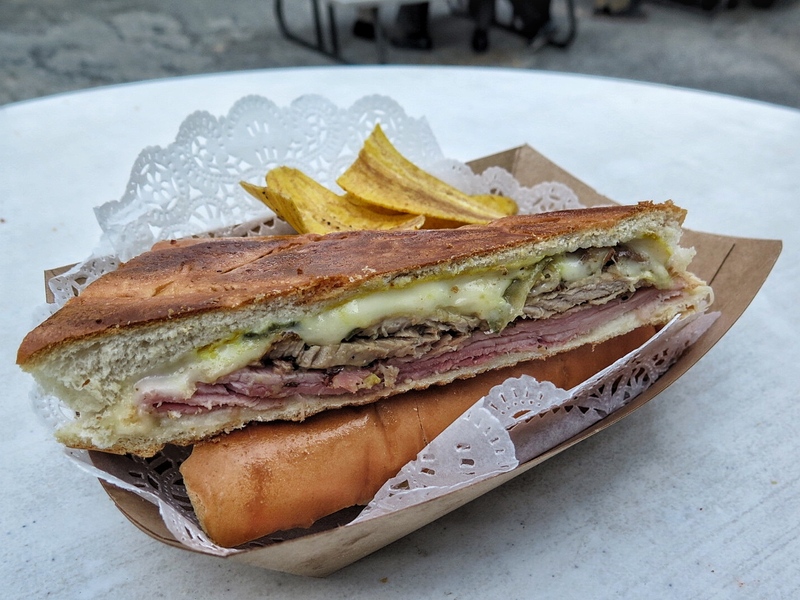 And, most importantly, the sandwich was not pressed hard enough to make all of the ingredients fuse together (a key factor in a Cuban sandwich’s success). So when I spotted Buena Gente’s Cuban sandwich on their Instagram account, I was intrigued. The Cuban bakery operates out of an adorable, mobile pink and blue pill- shaped “ventanita” and posts its daily schedule online. The couple behind the bakery, Manny and Stacie Antich-Rodriguez, moved to Atlanta from Miami in 2007 and quickly realized the differences in the two markets. There were no Cuban coffee stands serving pastries on every corner, and traditional bakeries, like the one Stacie worked at in Miami, were a dime a dozen. After testing products at the Atlanta Underground Market, the couple looked for a brick-and-mortar store, but instead landed on a food truck they found on Craigslist. The adorable truck is worth seeking out because it sells the best Cuban sandwich I have had in Atlanta thus far. Starting with a homemade mojo (a Cuban marinade of orange juice, garlic, and spices), Stacie marinates a boneless shoulder pork overnight and roasts it for four hours. The pork, ham, and Swiss are piled onto a crusty bread slathered with salted butter before being compacted on a sandwich press weighted down with foil-wrapped bricks. The result is a crackly exterior like creme brulee that gives way to the salty, porky filling ensconced in melted Swiss cheese that stretches into long strands with every bite. It was perfect. Sweet and savory pastries from Buena Gente. Buena Gente also offers up many exceptional pastries. Perfectly sweet, crumbly pastelitos (a puff pastry danish of sorts) filled with homemade guava preserves join golden fried empanadas stuffed with fillings such as chicken with green olives (the truck’s bestseller), ham and cheese croquetas, and other rotating options. Stacie makes everything from scratch with the exception of the sandwich bread—there’s just no room for such production in the kitchen they share with 14 other food trucks. If you need an additional boost for the day, Cuban-style coffees such as cortado (espresso with warm milk and sugar), cafe con leche, and more are served alongside the pastries and sandwiches. Buena Gente’s food truck makes its rounds at events throughout Atlanta, and you can keep up with them through their Instagram or calendar on their website. Since the food truck climate in Atlanta is still a bit shaky, they still haven’t found a regular spot, but I hope they do soon—Buena Gente is a Cuban treasure. 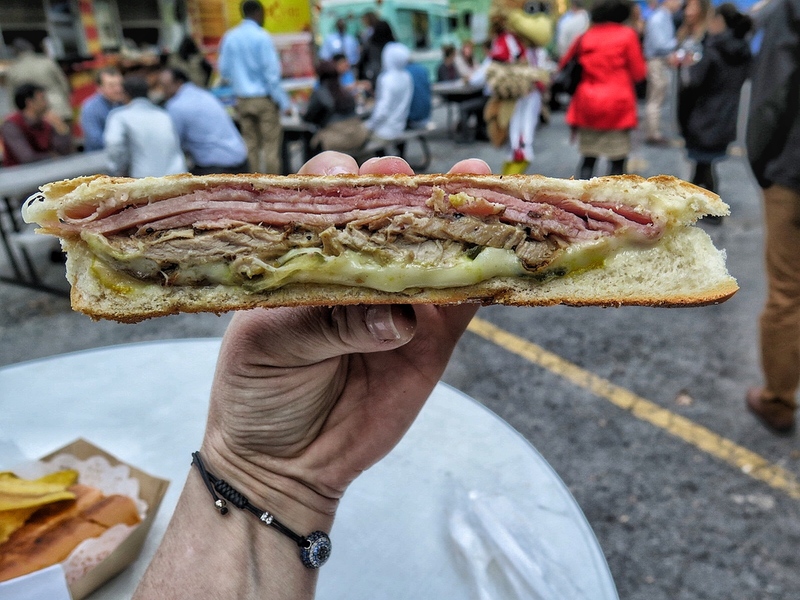 Update 3/23/17: Good news for those trying to hunt down this fantastic Cuban—Buena Gente announced on Facebook that will be at Piedmont Park’s Green Market every other Saturday starting March 25.